Ahh Treasure… One of the masters of Sega consoles. Their first Noami/Dreamcast title would have been Gun Beat, which is true to Treasure’s unusual naming of games. Gun Beat is a hybrid Shooter/Racer in which up to four players can compete. Predictably, you must complete each course in the allotted time in an everything goes shooting extravaganza. Gun Beat has three modes of play. 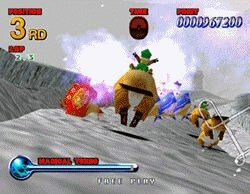 First, Race mode is for 1 player and you have to clear the 3 stages within a certain time. 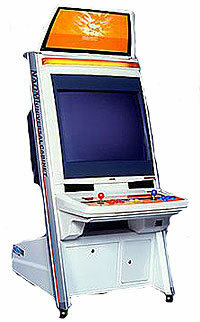 Second, Attack mode is for 1 player and you have to beat the high score in the selected stage. Third, Fighting mode is for 2-4 players to compete in the 3 stages. While racing you’ll encounter various traps and power-ups. For instance, you can power-up your gun with a red power doubler or you can pick up a yellow bonus item for 10,000 points. The traps are obstacles which slow you down like explosion boxes, some of which can be destroyed with your weapons. Each character (four different ones) has three kinds of shots: normal, magic and laser. The graphics, from what I’ve seen, look spectacular. Of course we know Treasure will likely make a top notch product from start to finish. 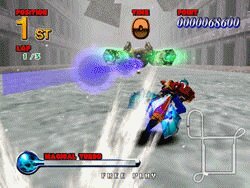 The game is presented in polygon generated 3D and features many of the Naomi/Dreamcast’s special effects. But alas, it was not meant to be and after months of suspicious silence, the game was cancelled on May 22nd of 2000. Treasure’s reason? They were unsatisfied with how the game was turning out (and supposedly, around this time, the game’s main programmer left the company). Treasure halts development on its first Naomi-based arcade game, Gunbeat. Tuesday, GameSpot News received word that Treasure has halted development of Gunbeat. The company has released official comment citing that « development may resume when the conditions are met once again, but as of May 22, the development [of Gunbeat] has halted indefinitely. » The NAOMI-based arcade title is a shooting game where players take control of a futuristic motorbike, using a jump and a shoot button. Although players may not see Gunbeat in arcades, the company provided solace to gamers by saying, « We apologize for the halt in development, but expect to see a new title that we are currently working on. » Whether this will be a new, improved version of Gunbeat, or a completely new title is not known at this point.